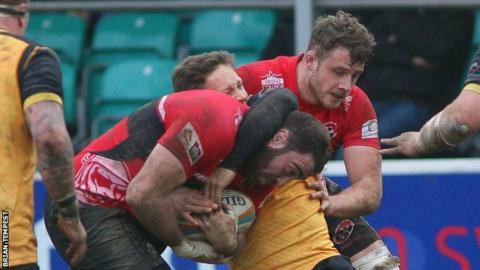 Cornish Pirates coach Gavin Cattle says his side will not repeat their poor performance against Ealing in next week's Championship Cup semi-final after a 28-8 loss to them on Saturday. The Pirates conceded two tries in either half to second-placed Ealing to drop to fifth in the Championship. "We're pretty disappointed with that effort, things didn't go our way for whatever reason," Cattle said. "I'm pretty confident we'll give a much better account than that next week." Cattle added to BBC Radio Cornwall: "The challenge is going to be massive, but I'm pretty sure this bunch of lads is going to be raring to go." Ealing's journey down to Cornwall was disrupted by a broken down bus, but it was the Pirates who stuttered during the game according to Cattle. "We clearly came second best, no excuses," Cattle said. "The nuts and bolts of our game were nowhere near good enough. "Our line-out was up and down and every time we got a positive we couldn't back it up with another positive."